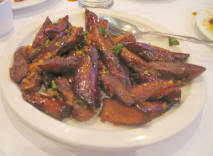 Cut eggplant into finger sized pieces-cut lengthwise, then into quarters etc. Saute with some water in a non-stick pan/wok, until soft. When soft, remove from pan. thin, thicken with 1t corn starch mixed with 2t water.